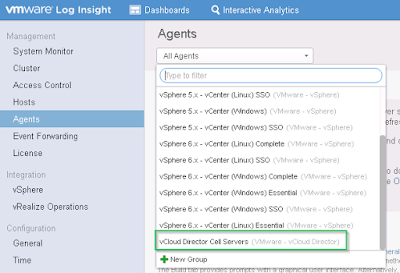 I was recently asked how to go about configuring the Log Insight Agent with VMware vCloud Director and thought that I would take the time to document it here for anyone else who is interested. 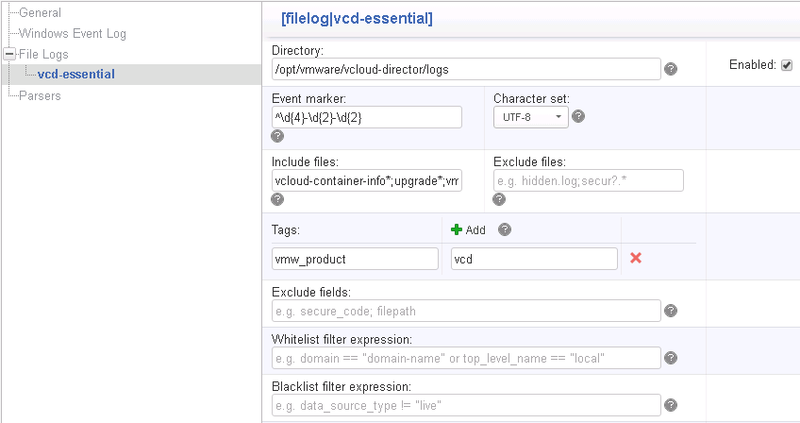 Logging in vCD is normally handled by log4j and configured by $VCLOUD_HOME/etc/log4j.properties.with the official KB located here. You should either use log4j OR the Log Insight Agent, but not both or you will have event duplication. 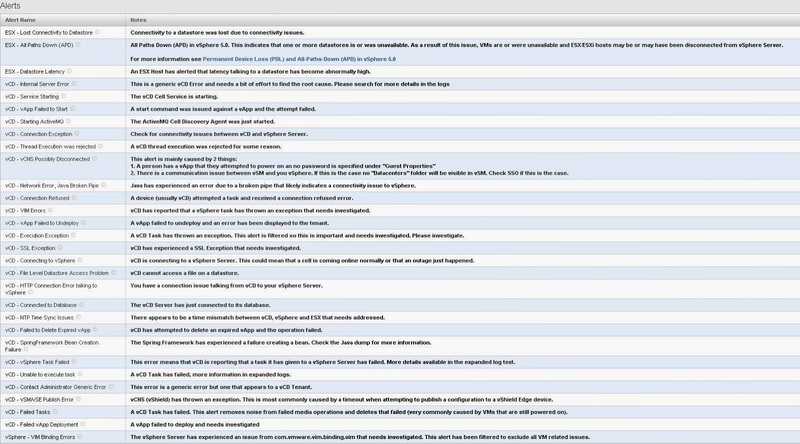 First a quick overview of the log4j configuration. 3. At the bottom of the file go ahead and append the below 6 lines outlined in the KB making sure to change your target FQDN. 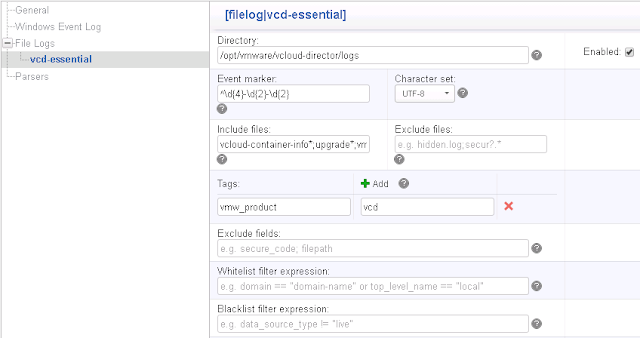 vCloud Director supports RHEL and CentOS so you only need to worry about the RPM install of the Log Insight Agent. First though, we need to do some prep work on the Log Insight Server. 2. 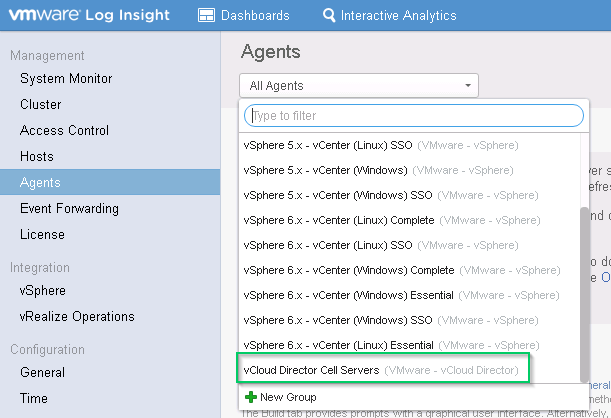 Create your Agent Group – From the Administration window select Agents and then highlight the vCloud Director Cell Servers pre-defined Agent Group. 3. Next you will need to define a filter that limits this collection to only vCD Cells. My test example here is very basic and limiting to hosts with a certain hostname prefix. You can see in the bottom section of the agent group the actual files that will be collected by the agent. By default the agent only collects info level logs but you can easily switch that to debug level logs if you desire. Feel free to check out my very basic sizing calculator on Github if you are curious of the impact of the additional logs. For now, just hit Save Agent Group to continue. 4. Now you are ready for the actual agent installation! You will need to copy the RPM to your vCD cells /tmp directory. 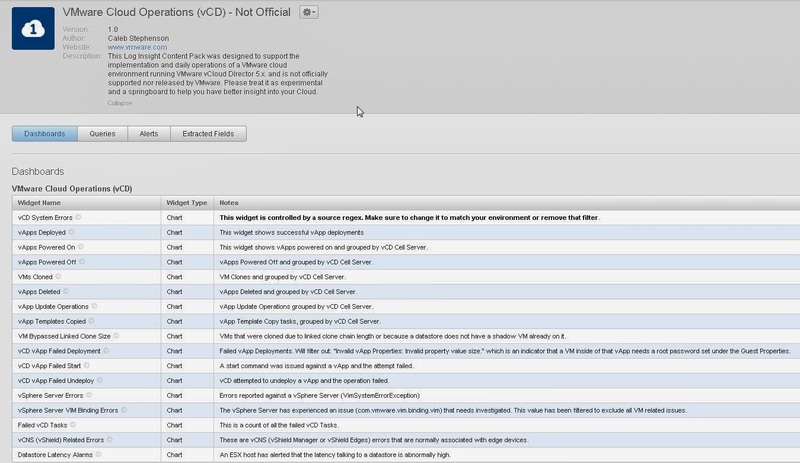 The LI Agent will need to be installed and configured on every vCD Server. Note: At some point after this step you will need to decide when to remove the log4j configuration and when to enable the Agent. I would personally recommend disabling log4j before installing the agent as short term you won’t lose any events since the LI Agent will go through all the log files on the server and forward them on. 6. 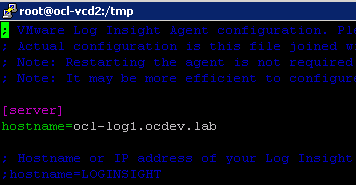 If you downloaded the agent from the Log Insight server it is supposed to be forwarding to then you don’t need to modify the liagent.ini file but if you downloaded it from my.vmware.com or another Log Insight Server you will need to update the target hostname.